Dr. Benjamin D’souza, CMC alumnus (batch of 81), currently working as Paediatrician and Paediatric Emergency Physician at Women’s & Children’s Hospital, Adelaide was recently awarded ‘Humanitarian Overseas Service Medal’ for his work in Pakistan in 2010. 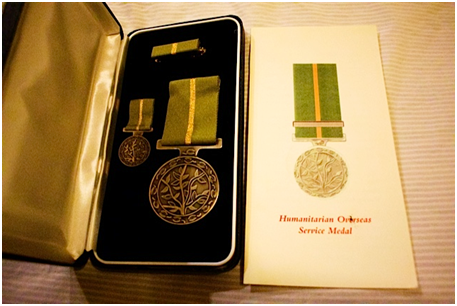 The Humanitarian Overseas Service Medal honours members of recognised Australian groups for emergency humanitarian service overseas in hazardous circumstances. He was part of the A ustralian Disaster response team that was deployed to provide medical service in aftermath of the 2010 floods. They set up a field hospital in Kot Addu and provided emergency medical care for the injured and displaced of the region. The team was there for 4 weeks, providing care for the affected people. The floods began in late July 2010 resulting from heavy monsoon rains. Approximately one-fifth of Pakistan’s total land area was underwater; the floods directly affected about 20 million people, with a death toll of close to 2,000. Benjy and his wife Lynda, an anaesthetist, also an alumnus of CMC (batch of 82) have been involved in medical education in India. In March 2013 they led a team of paediatric specialists from Australia to conduct Continuing Medical Education for nurses in basic and advanced paediatric care, and updated the anaesthetic technicians in epidurals and laryngeal mask airways. In November 2013, Benjy was back again, this time in Philippines when Typhoon Haiyan hit South East Asia, particularly in Philippines, It is the deadliest Philippine typhoon recorded in modern history, killing at least 6,300 people in that country alone. Benjy was part of a group of National Australian Disaster response Team that was deployed by the Federal Government for relief work to the Philippines. He went with ‘Team Alpha’, the first Australian medical team to be dispatched to the disaster-ravaged city of Tacloban to provide vital support. The team was deployed from the Darwin-based National Critical Care and Trauma Response team shortly after the typhoon hit. Regarding the honour which was bestowed on him, Benjy remarks – “I owe this award to CMC that taught me and shaped me into the doctor I am today. Above all, were it not for the grace and mercy of Christ in my life, this day would never have been possible”. Congratulations to Benjy on receiving this award for all the great work he has been doing for the glory of God, and our best wishes to Lynda and him.